The long wait is over. Fortnite Nerf Guns are here! These include Nerf dart firing guns and water squirting Super Soakers. 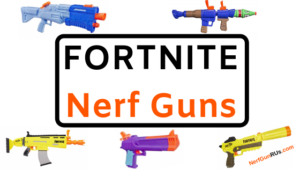 There has been such a huge demand for Fortnite Nerf Guns due to the extreme success of Fortnite. As many of you know, Fortnite is an animated, battle-royal game that is free to play for everyone. There are multiple game modes; however, the main goal of each mode is to be the last one standing. Fortnite has evolved quickly with their seasonal game play. They have really captured their audience by constantly updating their battle island and keeping us anticipating new updates. Fortnite weaponry includes: Assault Rifles, Shotguns, Sniper Rifles, Pistols, Rocket Launchers, Grenade Launchers, and a variety of grenades. There is never a lack of destinations and a constant supply of challenges to help you upgrade to higher levels to unlock new abilities, and dance moves. Yes, dance moves. Fortnite dance moves have taken over! If you have a favorite Fortnite dance, tell us about it in the comment section below! 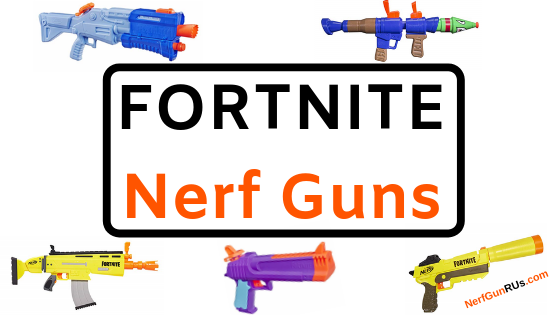 Now let us get into the main feature of this post, The Fortnite Nerf Guns! Currently, Nerf and Fortnite have come together to produce 5 authentic looking Fortnite Guns. These 5 guns are The SCAR Assault Rifle, The Silenced Pistol, The Hand Cannon, The Tactical Shotgun, and The Rocket Launcher. 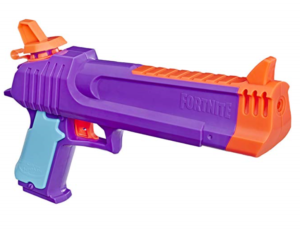 The SCAR and Silenced Pistol are the only two that fire real Nerf Darts; The Hand Cannon, Tactical Shotgun and The Rocket Launcher are all Super Soakers that are great water guns to help beat the heat! SCAR stands for Special Operation Forces Combat Assault Rifle and is modeled after a real gun. The real combat assault rifle is used by the elite special forces who are properly trained to use them, real guns are not toys. Fortnite Nerf Guns that are modeled after the real SCAR are toys. You will have the feeling of being in the actual video game. The Fortnite Nerf SCAR is an automatic Nerf Gun that requires 4 AA batteries. The inside of the Fortnite SCAR uses the same firing mechanism as the Nerf Stryfe, making for quick firing with little-to-no jams. If jams do occur, pop the 10 Nerf Dart magazine out and clear the Nerf Dart that is in the way. This Nerf Gun is huge and over sized. This is the point of this Nerf Gun, The Fortnite Guns are giant and awesome in game play. So of course, this means, Nerf needed to make their Fortnite Nerf Guns the same way! Legendary means the best you’re going to get when it comes to damage and accuracy. With The Fortnite Nerf Legendary Sildenced Pistol, you get a Nerf pistol that pulls back to prime and fires one Nerf dart per prime and pull of the trigger. The Silenced Pistol holds 3 Nerf Darts allowing you to take out 3 targets, with a quick head shot, of course. A silenced pistol wouldn’t be complete without a detachable silencer. Nerf went all the way to make their silenced pistol look as close to the Fortnite version as possible. The Fortnite Silenced Pistol in actual game play is a semiautomatic. The silenced Pistol you get to fire in real life needs you to reprime 3 times to fire 3 shots quickly. Make your shots count. Easily the favorite of shotguns in Fortnite when it comes to speed for up-close combat eliminations. Sometimes you drop on a blue tac, sometimes, a grey tac. 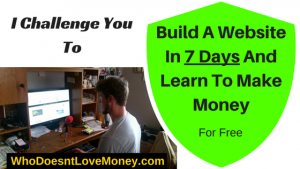 You take what you can get and stay alive with what you got. Tac shotguns are a great way to Get An Edge On Your Enemy! Below you will see the Blue Tactical Shotgun Super Soaker, but here we have an amazing Nerf Gun that looks exactly like the Tactical Shotgun in Fortnite and fires real Nerf Darts. Pump action while holding 4 Nerf Darts gives you an opportunity to drop your target with 4 shots as fast as you can pump and squeeze the trigger. 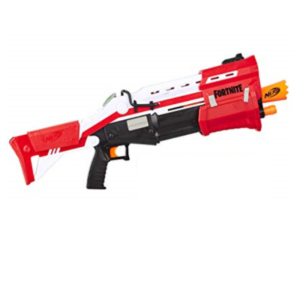 The Fortnite Nerf Tactical Shotgun comes with 8 Nerf Darts giving you two sets of full ammo to fire at your opponent. My advise is to always have enough Nerf Ammo on hand to take care of 10 times the problems you expect to encounter. Better to be safe than sorry! The Nerf Tactical Shotgun is going to help with the intimidation factor of the giant Nerf Gun as well as the firepower that comes with it! Oh, the Dagle, The Desert Eagle, The Hand Cannon, The Big Pistol, The Pistol that fires sniper rounds. What ever you choose to call the Fortnite Hand Cannon is up to you. The only thing that matters is how extremely powerful one is when wielded in Fortnite. Now there is an upgrade you can do with a Hand Cannon, if you have two, one in each hand, then you go from a Hand Cannon to Duel Pistols that wreck twice as much as a single Hand Cannon. Normally when found, a Hand Cannon is purple, epic and is a great multi use weapon in Fortnite. Now the real life Fortnite Nerf Hand Cannon is pretty close to the actual game. When you load up your Fortnite Nerf Hand Cannon with a full tank of water, you are free to blast as many targets as possible. Don’t just get them wet… SOAK THEM! The close combat, quick, sure-fire way to get eliminations in Fortnite, The Blue Tactical Shotgun. Blue Tac for short. Much quicker than the pump shotgun, the tactical shotgun gives you 8 shots to fire as fast as you can repull the trigger and pump to prime your next shot. In Fortnite the tactical shotgun fires real shotgun shells; in real life the Fortnite Nerf Blue Tactical Shotgun sprays a powerful stream of water at any target you choose. There is no better way to enjoy a hot day then super soaking your buddies. Now that Nerf has teamed up with Fortnite, you can parachute off your own battle bus and find your own Fortnite weaponry. If you find the Blue Tactical Shotgun, your competition better be ready to get SOAKED. When it comes to extreme, destructive power, The Fortnite Rocket Launcher is the weapon of choice. On The Fortnite battle-royal island, you can find rocket launchers in chests and loot drops. When you want to quickly take someone out of the game, pop them with a rocket and end their game. The Fortnite Rocket Launcher comes in all kinds of rarities and game modes, high-explosives is a game mode that only features rocket launchers, grenade launchers, and a variety of grenades. 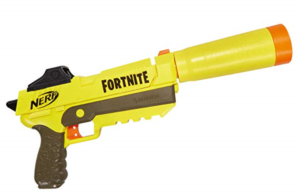 The Fortnite Nerf Rocket Launcher Super Soaker looks like it should be a blue rare rocket launcher; however, you may even consider this a common rocket launcher. Either way, this is an awesome Super Soaker that makes for a great way to beat the heat or soak some of your friends that aren’t expecting it. Soak them with a Rocket Blast! The rocket even has its mean face painted on! Check out prices and make your purchase below! 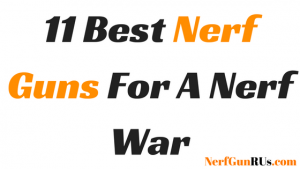 NerfGunRUs.com works with Amazon.com to make sure you learn all about the Nerf Guns you want to know about and make sure they arrive on time when you order them! Fortnite is a great game that has taken gaming to a whole new level. Fortnite teaming up with Nerf has brought Nerf Warfare to a whole new level! 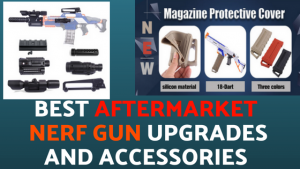 Make sure you gear up with the best Fortnite Nerf Guns and maybe even have a Chug Jug handy in case you lose too much health. 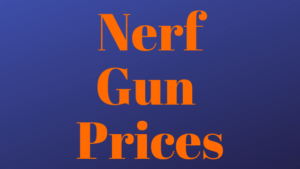 Thanks for taking the time to check out NerfGunRUs.com. 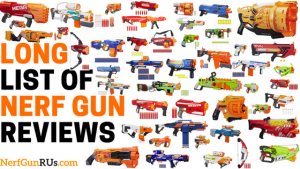 There are all kinds of reviews on all types of Nerf Guns. If you have anything to add to a review, have a general question about a Nerf Gun, or just want to leave an awesome comment, feel free to do so in the comment sections of any post. Remember to always stay alert, stay aware, and always Get An Edge On Your Enemy!